Very smart move by Microsoft. Having developed with Microsoft mobile platforms since CE 1.0, I've never found them to really understand mobile that well. Kind of ironic that their greatest financial success could potentially now be for them to do nothing other than collect royalty payments! Visiting Australia? Try amaysim in your mobiles & devices! Just spent 9 days on the Gold Coast and for once won't have any expensive bills for roaming. We took away 1xVodafone 845(Android), 1 Asus Netbook, 1 iPhone and 1 iPad. Plus also took my 2degrees Wifi modem/hotspot. Rather than using our New Zealand SIM cards, we purchased Amaysim SIM cards (www.amaysim.com.au). - 1GB data pack is $9.90! You can check usage via a short number as well as via their website. The cards use the Optus network, so there is good coverage. I had to call customer services a couple of times and you actually talk to a REAL person, located in Australia who can actually solve your problems. One guy I talked to admitted that even he didn't know how the company could afford to pay him with the low rates that they were charging for calls, txts and data! Towards the end of the trip I also picked up a Telstra T-Touch Tab for AUD$219 and used yet another of my amaysim cards with it (and now that I'm back in NZ, running it nicely on 2degrees). Normally the unlock fee is AUD$100 (which would have meant that it would have cost $299, being $199 for the tablet and $100 for unlocking) but since I didn't want the Telstra SIM card and 5GB of data, they did a deal for me and gave me an unlocked unit for only $20 more than the base unit. It's running Android 2.1 currently and performs very well. We used it a lot for navigation (using the Google Navigation app) and although the camera's are only 2 megapixel, they are surprisingly good. Froyo/2.2 is due out soon for it (due end of March, but they've had some delays). BTW - it's a rebadged Huawei IDEOS S7. I couldn't believe my luck the other night - yet again, about 6:15pm in the evening I received a phone call at home and when I looked at the phone it was a "Private Caller". Could they be so stupid as to try phoning me again to "fix my PC"?? YES! I was so pleased. Rather than getting really annoyed with them, I decided to play along for as long as my patience would allow. Can't remember who they said they were from, but it was because I'm a "most important operating system customer" that they really wanted to help me. To cut a long story short, they got me to look at the c:\windows\inf folder and claimed that all those files in there were an indication of how badly infected my computer was 8-). What did surprise me is that the steps that they got me to do were actually quite well worded. They had obviously gone to a lot of trouble to write their script and in some respects if they turned their skills from evil to good, they could actually be quite affective as Tier1 helpdesk staff. Anyway, when they started with their story about "Oh dear sir, your computer is very badly infected" I decided that I had had enough (it was dinner time, trying to get dinner into a 2 and 7 year old). So I said "Actually, I'm a systems engineer and I realise what you're up to so you can stop right there. Can you hear a knocking on the door? I've kept you on the phone to trace your call and that will be the police". At least they were smart enough to understand that and that's when they hung up on me 8-). For several nights (around this time, 7:30pmish) we've received a call from 01300367890. Sometimes when we say "Hello?" we get an automated voice a couple of seconds later saying "Goodbye" and other times just a hangup. Any ideas what the number is? Tried googling it and found the number range on some UK phone spam site, but no solid information other than that. Would like to know who it is - then maybe a few phone calls to them would be warranted (but what I'd say to them would have to be censored). Xmas discounts at Noel Leeming Riccarton - save and donate this Xmas! Noel Leeming Riccarton/Christchurch (in Westfield Mall, Christchurch) have a special deal where you can get Cost*+10%+GST^ on a wide range of items (see Terms & Conditions below) from tomorrow (Thursday Dec 17) until Sunday Dec 20. They will also donate 4% of ALL sales to Oaklands School (www.oaklands.school.nz). This is a great win-win situation where you get a great discount and Oaklands school receive a very generous donation from Noel Leeming Riccarton. TIP: In the past I've found this deal to be especially good when purchasing accessories for games systems eg. Nintendo DS accessory packs. This offer begins Thursday 17 December 2009 and end Sunday 20 December 2009 and only at Noel Leeming Riccarton. *Cost + 10 + GST Terms and Conditions: Cost reflects the average invoiced price of a product but does not include any volume related adjustments which may apply. ^ Offer does not apply to Noel Leeming gift card purchases, apple branded product, gaming consoles and bundles, phone cards, home deliveries fees or extended warranties. Cannot be used in conjunction with any other offer including interest free credit deals. You simply need to produce THIS flyer to be eligible for the promotion. Disclosure: I am a parent from Oaklands School and am also on the Parent Teacher Association for Oaklands school. 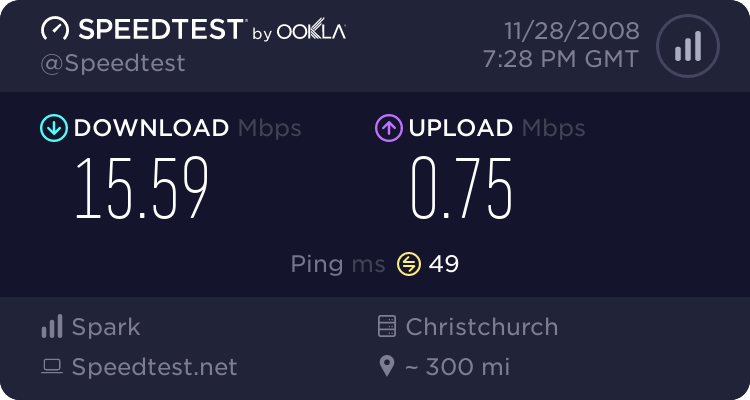 In the past I haven't been too happy with my ADSL speed at home. But with results like this, I definitely can say that working from home is definitely possible! I have noticed lately that grabbing the likes of XP Service Pack 3 was an extremely painless exercise (at 2-300MB), but didn't quite realize that the speeds were this good! Freeview and HDMI cables for $23 vs $90! We've got Sky, but decided yesterday to get a Freeview box to get the additional Kids channel plus more importantly at the moment - to get the extra Olympic channel. The other benefit of getting Freeview HD is that we'd finally be able to make use of the HD capability of our Sony Bravia V-Series tv. I have to admit that I didn't spend a lot of time researching the options, but the Zinwell ZMT-620HD @ $399 seemed a reasonable deal. For a short time I contemplated putting a card into my media PC, but I wanted something that "just goes" versus something that *may* involve updating drivers, upgrading my PC (because it may be underpowered) etc. etc. Overall, I'm impressed with the ease of setup. Plugged it in, selected the auto-scan option and was running within 2 minutes. The clarity is amazing - although as somebody mentioned on TV recently, the problem is now that you see what people (eg presenters) really look like (flaws and all) - which may not be a good thing in some cases! The Electronic Program Guide (EPG) is very good, although I have had a few issues where I couldn't get it to come up (might be bad batteries in the remote). Note: We already had an appropriate antenna, so all I needed to do was unplug the antenna cable from the TV, plug it into the Freeview box, then use another cable from the Freeview back to the TV. My only gripe would have to be the lack of HDMI cable with the box! Kinda makes sense that if you're buying an HD Freeview box that you want HDMI?? They included component and composite, but no HDMI. I asked at the store that I got the Freeview box from about HDMI cables and got the usual "Oh, you'll need the $90 HDMI cable then". From what I've read (after googling "HDMI cable scam"), it appears this is common around New Zealand. Personally, I went to Dragon PC (www.dragonpc.co.nz) and grabbed a 3m HDMI cable with Lifetime warranty manufactured by Dynamix - for the grand total of around $23! Bean counters shouldn't interfere with burgers! A few months ago I struck McDonald's new "JIT" system, where they no longer make-and-hold food, but rather make-on-demand. At the time I couldn't believe how poorly the system was working. A large group of us (with under-3's) decided to get together one Saturday lunchtime at the Riccarton branch as we wanted something that the kids would like with the minimum of effort. What we struck was a complete disaster. The staff looked at the end of their tether, nobody seemed to know what was happening and the management of the store didn't even think to put up a sign indicating that they were trialling a new system. Many people walked out and after about 20 minutes we finally got our orders. Later that weekend I decided to do some research into the new "system" and discovered it was a new system being launched globally. At the time I even found an article from a management website which explained that they were making the change to increase the quality of the food (because it doesn't sit in warming trays) and at the same time - and in my opinion is the TRUE reason for the change - they would reduce costs significantly because they would no longer be throwing out food if it wasn't sold within 10-12 minutes. The article also pointed out that while the new system seemed good on paper, the cost savings would be lost IF they failed to continue to deliver "fast food" - which lets face it, is the main reason most people go to McDonalds. So rather than just moaning to friends and family, I decided to contact McDonalds and question whether their strategy was such a good idea. I was particularly interested to hear their feedback to the comments that I overheard from customers while I was waiting in line and the fact that many people now walk away rather than having to deal with chaos. Unfortunately when I went to the McDonalds website I was disappointed to see that they have a notice on their site saying that they will accept feedback but don't expect a reply. I must have hit a raw nerve though 8-). About two days later I had a phone call from the owner of many of the Christchurch branches and he explained the logic behind the changes that were being implemented in the restaurants. I really appreciated his time and after talking with him was somewhat hopeful that I had simply struck "teething problems". That was a few months ago now and I can quite clearly now state that it wasn't teething problems. The new system is STILL a disaster. Admittedly some branches have tried to get around the problem with technology - using wireless PDA's, staff members weave between people in the queues and takes orders, handing them a ticket with a number on it that they then present at the counter to pay for the order. I have to admit by being intrigued by the new system - but that only keeps me entertained for a couple of minutes, after which the realization that the delays are still going to be much the same as before sets in! Congratulations McDonalds - instead of the new system saving your business, you've actually put a nail in your own coffin. Your burgers don't taste any better/fresher - they just take twice as long to get now (on a good day). You've failed to actually understand that people have been loyal to your brand because of consistency (anywhere in the world) & SPEED. Without your make-and-hold method, you simply cannot deliver food with the speed and efficiency that your brand has offered for decades. Perhaps it's time for me to take a closer look at that local burger company offering shares in their company 8-). ActiveSync error: /Separate is invalid? He connected to a Windows Mobile 5 device with ActiveSync (v4.2 from memory - a recent version) and found that whenever he hit the "Explore" button (after it had connected), ActiveSync would come up with an error saying that the path "/Separate" was invalid. Strange thing was that we could explore the device from Windows Explorer - just couldn't kick off exploring the device from the Explore button on the ActiveSync window. This was a new one on me but luckily after some extensive googling a colleague found out that it can be caused by having an older version of IE on your machine (eg IE 5). They put IE6 onto the box and the problem went away. Just thought I'd put this up for anyone that strikes it in the future - or just in case I forget the cause of the problem when we go to test the next release of our software! At Christmas we decided to get my father a printer/scanner combo - something to make printing photos from his digital camera a lot easier. It wasn't until after New Year that I got around to asking my father how things were going. There was a long pause - and then an even longer description of his attempts to get it going. I was somewhat surprised that he had trouble, but basically now that he had his 4th one, it was finally working. First two had mechanical problems - basically poor manufacturing meant that paper trays etc wouldn't feed paper etc. The third one had the most unusual fault - it would power up and demand that you set a language, but wouldn't actually accept the command (on the front panel). If you then startup the unit in maintenance mode, it comes up with a code of "1+3". At this stage, Brother were extremely helpful and especially after hearing that this was his 3rd unit decided that they'd test a new unit from their stock and ship it to him direct. The 4th (and hopefully final) unit is running perfectly. I've now "inherited" the 3rd unit and had hoped to get it going. After a couple of hours I managed to get the latest firmware onto it, but it still comes up with a fault. I emailed Brother and asked them if they could tell me what the "1+3" error means, but they can't tell me unless I'm a service agent. Not really too sure what to do with it now - it seems criminal to dump the unit since it's basically brand new (and most likely just needs some sort of reset). Not too keen to take it to a service agent either, since I'd guess that their fee will most likely exceed the $129 initial purchase price 8-). Anybody need a large paper weight? My job involves working with a variety of mainly Pocket PC or Windows CE devices, setting up GPRS connections over cable and/or Bluetooth. Setting up of these connections is either done programatically (in code) or manually (when all else fails). Through this work (which sometimes involves visiting other parts of the world), I've come up with, err, I'd hate to call it a "wealth of information", but let's just say that I've struck enough problems over the last few years that I'm sure that SOMEBODY out there might benefit from some of the tips that I'll be putting up.